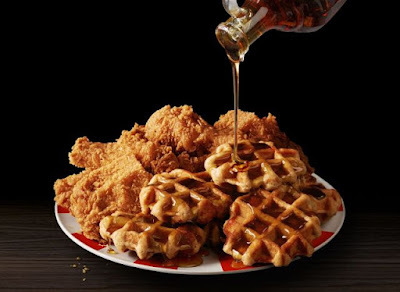 KFC is bringing back Kentucky Fried Chicken & Waffles for a limited span starting March 23, 2019 and running through April 29, 2019, at participating locations, while supplies last. Technically, they're bringing back Belgian Liege-style waffles for a limited engagement and pairing it with their regular-menu Extra Crispy fried chicken. As before, you can order Chicken & Waffles as part of a basket meal or as a sandwich. The basket meal includes a choice of either a fried chicken breast piece, a fried chicken thigh and drumstick, or three-piece tenders, paired with a waffle and a side of Mrs. Butterworth's syrup. It's priced at $5.49 (may vary). There's also a Big Basket meal for $7.99 that includes a choice of two-piece white meat fried chicken, three-piece dark meat fried chicken, or four-piece tenders, plus two waffles and two syrups. The sandwich costs $5.99 and features an Extra Crispy boneless breast filet served between two waffles. As with the basket meals, it comes with syrup. You can find my previous review of KFC's Chicken & Waffles here. It was first introduced November of last year but was popular enough that they brought it back again quite quickly.